10th Annual 9-11 5K Walk & Charity Event, to register for walk see: http://www.shbllp.com/?page_id=15 Find our adoptables under the pink canopy at this annual charity walk in remembrance of 9-11. This family event includes a 5K Walk, Pancake Breakfast, the In-N-Out food truck, a video game truck, and many vendor booths. Good Day LA - News Event, Los Angeles Good Day LA will be featuring a some of our Lovebugs! The dogs will be modeling some of the latest Halloween fashions from Anything Canine Boutique in Laguna Beach. KTLA morning segment - News Event, Los Angeles KTLA will have 3 live morning segments featuring our Lovebugs! We will be on location at D.O.G. Boutique in West Hollywood while our dogs show off some trendy Halloween costumes for 2012. Join us for adoptions from 11:oo to 3:00 pm at Pet Country 22485 El Toro Rd. Suite A, Lake Forest, CA 92630 We will have our adorable Lovebugs available for adoption at the awesome Pet Country, "the health food pet store". Just look for our pink canopy out front the store! Holiday Photo Fundraising Event Join us on December 7, 2013 for a fun filled doggie photo shoot with Kristina Lace! Please RSVP to mayra@poochsitter.com or call 714.633.4821 for a reservation. Join us for adoptions at Krisers in Newport Beach! We will have many adoptable dogs/puppies from 11:00 am - 3:00 pm at Krisers, 1044 Irvine Avenue, Newport Beach, CA 92660 Kriser's is an all-natural pet food store. I Heart OC Fundraiser Event At 6 A.M. April 27, 2016 to Noon April 28, 2016 give where your heart lives! Give to Lovebugs Rescue. Go to: https://iheartoc.org/npo/lovebugs-rescue/ to donate directly to Lovebugs Rescue and help us win BONUS Prizes being awarded during this 30-hour period on Giving Day. 10th Annual Super Adoption Event Look for our PINK canopies back between building 4 and the chip yard, next to the cooling station. Floral Home & Garden Tour Santa Ana, CA 10 - 4 More details coming! 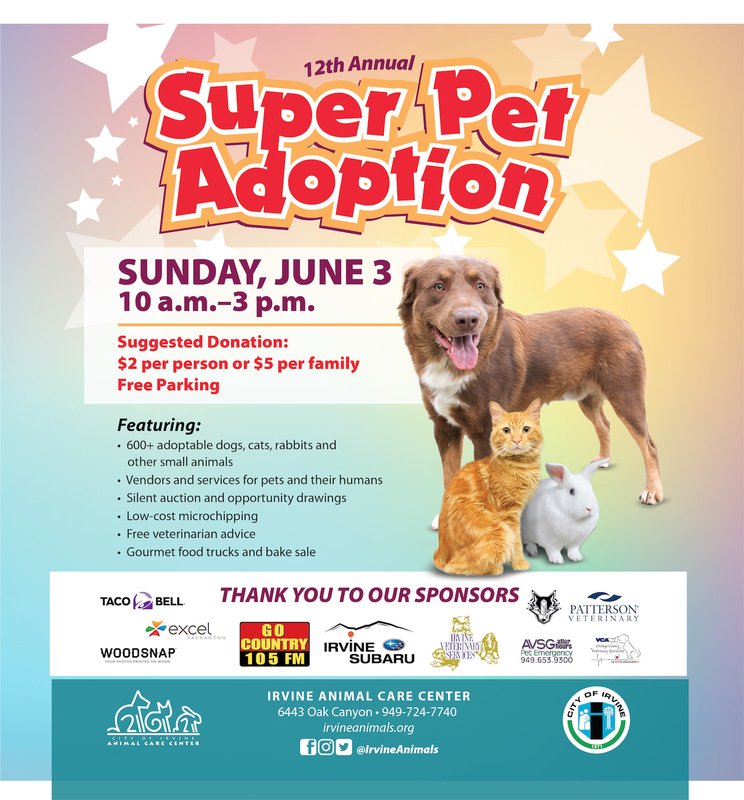 11th Annual Super Pet Adoption Event! Come on out THIS Sunday to meet our adoptable Lovebugs pooches! Look for our hot pink canopies at the grassy entrance to the event. FUNDRAISING EVENT Glassbaby Trunk Show! Please join Lovebugs Rescue and the community of Orange Park Acres for their annual tree lighting and donation drive. We are asking for Donations of Pee Pads or gift cards to Pet Supply Stores. Join Lovebugs Rescue and many other rescue organizations for a big adoption day at the Home for the Holidays event. Look for our hot pink canopies in the parking lot just past the entrance to the event. Lovebugs Rescue is proud to be a part of Strut Your Mutt! Please visit our team page here: https://bit.ly/2OuFsOt for more information. Come see us from 12 - 4 at the Lincoln Experience Center in Fashion Island, Newport Beach. We will have some of our volunteers there with our adoptable pooches!